First of all, I would like to thank Dr. Melliza for graciously agreeing to host this PSITE-XI and CDITE-XI Joint Assembly and Planning Session. If all school presidents would be as supportive as her, I am pretty sure the IT Education in Davao City and in Mindanao for that matter will flourish successfully. I also wish to thank all of you present here today for attending our annual gathering. Your active participation in this assembly will surely make this affair a success. We have been holding joint assembly for several years now for the following reasons. First, to update IT educators on the latest development in IT Education. Secondly, to inform PSITE-XI and CDITE-XI members of what has been accomplished for the past year. Third, to plan out activities for this school year. 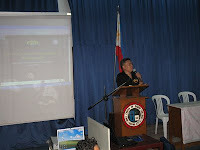 Fourth, to serve as venue for airing concerns and information sharing of IT educators. And lastly, to gain new friends or renew acquaintances. Today, we will hear presentations and updates from Dr. Casquejo of CHED-XI, Sir Edwin Marañon, former CDITE-XI president and yours truly. The election of new set of officers will follow after the updates. The last part will be the planning session for the year. I have been the PSITE-XI President for the past five years now. Much as I want to relinquish the post, it seems that there were no takers that time. But having been just elected to the PSITE national board and con-current Vice-President for Mindanao, it is really high time that somebody would take the cudgel and lead the group for Region XI. I will be bringing the voice of Mindanao in the National PSITE. Let me take this opportunity to thank the officers who worked with me during my incumbency as president and the members who were very supportive in the activities of PSITE-XI. It was indeed very fulfilling working and being with you. As we continue with this meeting, I hope that you will stay attentive, be participative and give your all out support and commitment to IT Education. Good Afternoon.